USS Tempest - U.S. Navy photo by PH2 Danny Ewing Jr.
patrol coastal (PC) ships to U.S. Naval Forces Central Command (NAVCENT), Manama, Bahrain, May 14. USS Tempest (PC 2), USS Squall (PC 7) and USS Thunderbolt (PC 12) are scheduled to arrive this summer. Two additional ships are expected to transfer next year. Commander, Patrol Coastal Squadron ONE (PCRON 1) along with a PC maintenance support team will also permanently move. Five PCs have provided dedicated coastal patrol capability to the Commander, U.S. Fifth Fleet (C5F) area of operation (AOR) since 2006. The PCs currently stationed in Bahrain are manned with unaccompanied, rotational crews. The forward deployment resulted in the decision to shift from 6-month rotational crews to permanent crews stationed in Bahrain allowing families to accompany their Sailors to Bahrain. The shift alleviates the significant strain placed on the crews and their families while ensuring capacity and capability. A total of ten PCs will be permanently stationed in Bahrain by the spring of 2014. Three PCs will remain stationed in the continental U.S.
PCs provide the U.S. Navy with a fast, reliable platform that can respond to emergent requirements in a shallow water environment. 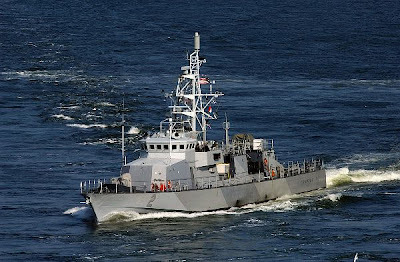 The primary mission of these ships is coastal patrol and interdiction surveillance, an important aspect of littoral operations outlined in the Navy's maritime strategy. These small ships are about 20 years old and have never been favorites of the "Big Navy" which even foisted some of them off on the Coasties until their worth seemed to gain some appreciation. Under a crash program valued at $4 million, the Cyclones — five of which are permanently stationed in Bahrain — are getting a new laser targeting system for their twin 25-millimeter cannons. The Mk-38 laser kit gives the “high-precision accuracy against surface and air targets such as small boats and unmanned aerial system,” according to contractor BAE Systems. to participate in exercise Cooperation Afloat Readiness and Training (CARAT) with the Royal Malaysian Navy (RMN), June 15. Freedom was the first U.S. Navy ship assigned to Commander Task Group (CTG) 73.1 to pull straight into Kuantan's shallow pier. 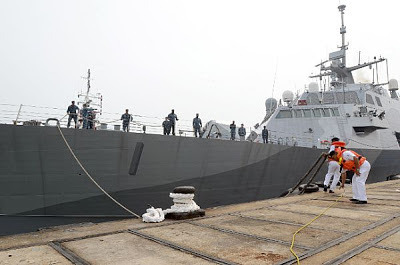 "Being pierside at Kuantan Naval Base gave us the chance to make an instant impression, and show regional navies what this ship can do and how we can contribute to mutual interests at sea," said Cmdr. Timothy Wilke, commanding officer. Fast, agile and mission-focused, LCS platforms are designed to operate in near-shore environments and employ modular mission packages that can be configured for three separate purposes: surfaces warfare, mine countermeasures or anti-submarine warfare. Freedom deployed to Southeast Asia with the surface warfare mission package. During the at sea phase, additional events that will highlight Freedom's capabilities include an inbound fast attack craft drill; a search and rescue exercise with Freedom's MH-60R helicopter; and a visit, board, search and seizure drill with Freedom's embarked surface warfare mission package boarding team. You might note that the LCS can land helicopters whereas the Cyclone-class PCs cannot. One would think that might be nice-to-have feature out there in the Arabian Gulf - but perhaps it is felt that there is enough air support in the vicinity that the PCs don't need to bring their own. While I am aware that the LCS mission is part of a learning curve, it seems to me that if the Navy wants to practice the LCS's intended missions, playing with the small boys in a more realistic environment ought to send an LCS to share the fun in the Arabian Gulf - perhaps simply providing helicopters coverage for the PC crowd if nothing else. Then the CO of the LCS will have a chance to make a "instant impression" in some way other than mooring to a pier. An Iron-clad MSO patrolling the waters off Bahrain. I worked those same waters on a wooden MSO - 20some years ago. PC's were conceived as NSW's next (bigger) SPECBOATRON asset for deploying and covering SEALs. Even with new weapon systems they were never meant to go up against anything but small arms fire. I loved being on the PRECOM crew of PC 13, but as LCS units come on line I would retire/give to the USCG the PC's as quickly as possible.